Courtesy of Berkshire Hathaway Hickory Metro Real Estate. 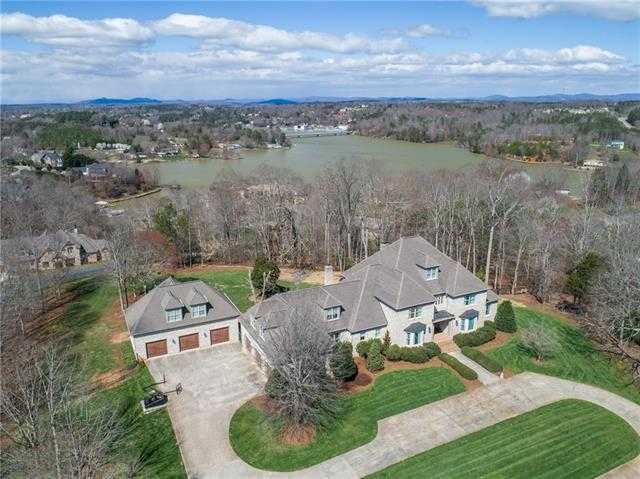 Fabulous family home perched on a knoll overlooking Lake Hickory in the distance. Offering the top quality finishes inside and out, this 11,000SF home is sure to please the most discerning buyer! The main level offers a two-story living room with a wall of windows overlooking the backyard pool oasis, formal dining room, large kitchen with marble counters, island, pantry, bar area, and adjoining keeping room with fireplace. The master suite retreat offers an expansive bedroom, his/hers closets, large bath with his/hers vanities, jetted tub, tiled shower, dressing room, and office area. You’ll also find a main level guest bedroom suite & laundry. Upstairs, three bedrooms all have private bathrooms and share a media room. The full lower level offers a den, home gym, billiards area, and full bath for pool guests. Outside, enjoy a heated pool, hot tub, triple attached garage, and triple detached garage with guest quarters, and a 3.56 acre lot with winter lake views. Please, send me more information on this property: MLS# 3368784 – $1,248,000 – 1565 46th Avenue, Hickory, NC 28601. I would like to schedule a showing appointment for this property: MLS# 3368784 – $1,248,000 – 1565 46th Avenue, Hickory, NC 28601.